Hello Angel fans, my name is TurboFool, but AFK I go by Jarrett, and I’ll be entertaining you for the next few minutes, assuming you’re easily entertained by mundane introductions from people you don’t know. Yay, you! The reason I have to introduce myself is become I’m brand new around these parts. 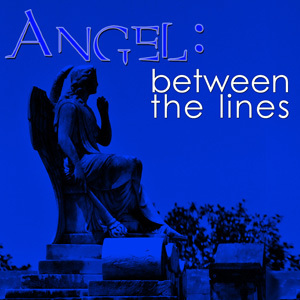 Yep, Angel Between the Lines is my first step into the Between the Lines network, and more than that, my first foray into podcasting! That’s right, this will be the first time my voice enters the podcasting universe (although Steve Eley did read one of my comments aloud on an episode of Escape Pod which made me way too giddy for my own good), and I couldn’t be happier about it. See, I got started late on this whole scene in general, so when I got my Zune 80 for my birthday in February of ’08 and decided to see what the hubbub was about, I went berserk. I have far too many podcast subscriptions than I have time to listen to, leading to epic internal battles over which shows to get hopelessly addicted to this week and then, after catching up, which other show to obsess over while the other ones start filling right back up again. It’s an endless, thankless, stressful task with no pay or health benefits to speak of. But I don’t care, because I’m loving it. It’s opened me up to great viewpoints from fascinating people, and wonderful sources of fiction from all sorts of incredibly talented authors. And getting to listen to the same voices every week really makes you feel like you know these people personally. So this community is one I’ve embraced on a pretty personal level and have really wanted to become a part of. Who doesn’t like a little bit of internet immortality, right? So far it’s kind of a kick. I had only just begun to listen to Buffy Between the Lines when this all started, so I’m just getting into how this all works, but in the meantime I’m loving the behind-the-scenes. I’ll be getting to flex a few creative muscles I didn’t know I had (actually, my fingers are crossed that they’re even there), and working with a really amazing team of people who seem to be having a blast putting this all together. What more could I ask for? Okay, that’s a stupid question, because right now you’re probably imagining all sorts of drastically more lucrative and awe-inspiring desires that I could have requested, but I’m just not that greedy, okay? I asked for this, I got it, and I’m happy with that. …also, the Oompa Loompas never made it through immigration, and the millions of dollars in unexpected inheritance hasn’t arrived yet from Nigeria. Now for a little background on me: One of the reasons I was drawn to this at all is because I’m not exactly inexperienced when it comes to performing. In fact, I was a professional actor for the vast majority of my life! And I’m uniquely and doubly qualified for my involvement here. As a kid, I did endless work in voiceover, playing roles in many cartoons (some of which people have actually heard of! ), radio commercials, dubbing over the lines of kids who mumbled too much in major motion pictures, etc., so I know all of the ropes. But I also have a more direct connection, as I both read for an episode of Angel, and was cast shortly thereafter in an episode of Buffy, where I was interrogated and intimidated by the Slayer, herself! Having been a fan of the show (and Joss in general), it was an exciting moment to say the least. So that feeling of personal connection to the Buffyverse ensured that I had to get involved here when the opportunity arose. One taste of being a part of this legacy just isn’t enough. Plus it gave me a totally unnecessary excuse to re-watch Angel. So that’s my mildly-entertaining introduction. Should the Senior Partners see fit, you’ll hopefully be hearing more from me as the production progresses. If not, just look around in all the typical hangouts, and odds are you’ll see TurboFool lurking somewhere in the shadows, writing overly-wordy rants nobody reads.